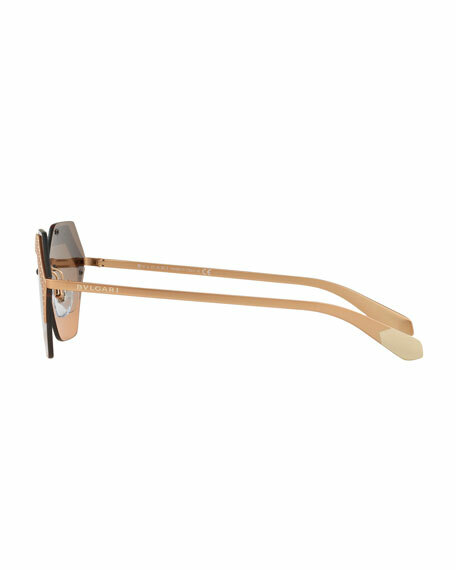 BVLGARI rimless hexagon sunglasses in metal. Honeycomb trim at gradient lenses. Emboldened by 2,700 years of Roman history, BVLGARI honors its rich past with modern designs. Classic yet contemporary, each watch upholds the brand's 130-year heritage with a timeless sense of exquisite beauty. BVLGARI's magnificent watchmakers ensure that each timepiece meets the Maison's standard of Italian elegance and craftsmanship. For in-store inquiries, use sku #2572668.